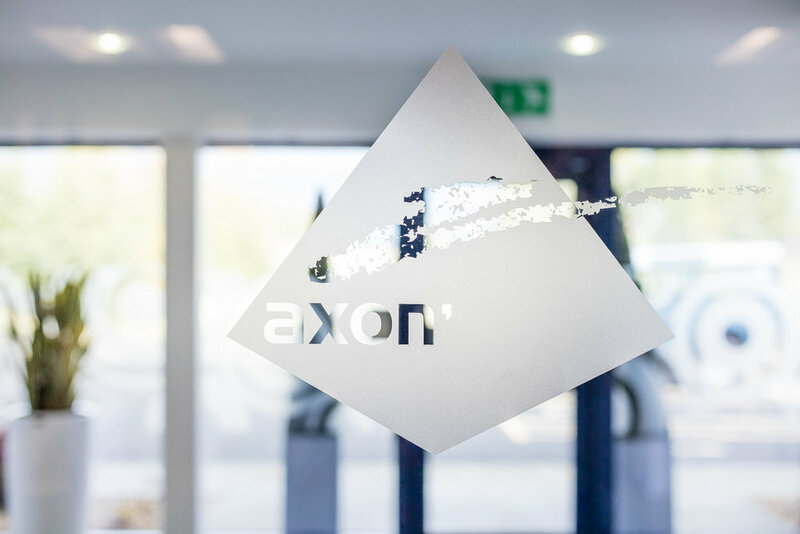 Axon purpose built their office and production space in Rosyth 10 years ago but its amazing how technology has changed the office landscape so dramatically in just a few short years. Roll forward to 2018 and a refresh was called for – whilst still smart, the offices were definitely dated and as the business has moved with the times, desk top tech has of course reduced in size and increased in power. Along with this, the need for more collaborative spaces was evident with the different disciplines within the business needing opportunities to work away from their desk in groups. 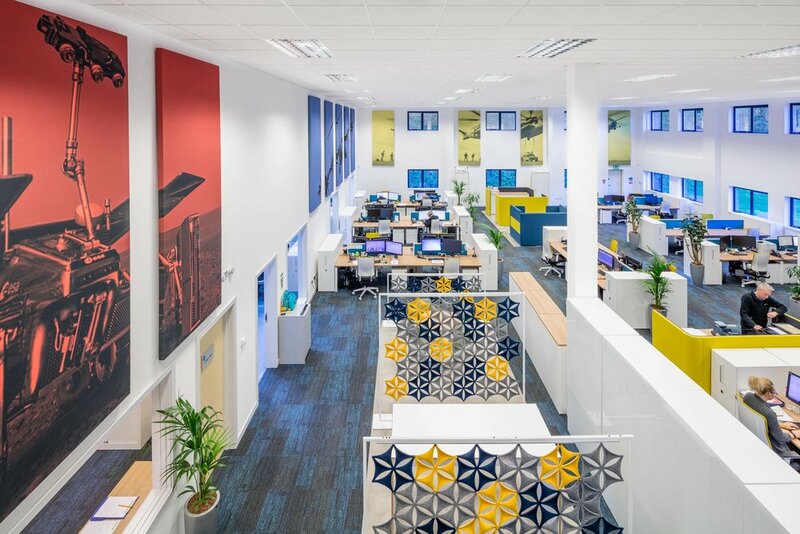 In addition to this, Axon were keen to celebrate the work they do, so the interior design team were tasked with introducing some imagery on the large wall surfaces that would deliver this. Amos Beech achieved this as well as incorporating the images on to acoustic materials to improve the acoustic performance of the space. Using the Samuel Bruce TeamTable benching system we were able to deliver the workstation functionality without having to increase the number of floorboxes – which was a challenge given the ground floor is heated via an underfloor heating system and a ground source heat pump. The result is a very tidy workstation installation where all the cables supplying power and data are contained within the integral cable management system and only appear at their exit points on each desk top. The Space Planning allows for various types of collaboration and quiet work settings in addition to more formal enclosed meeting rooms and cellular offices which offers something for everyone depending on the type of work they are doing. 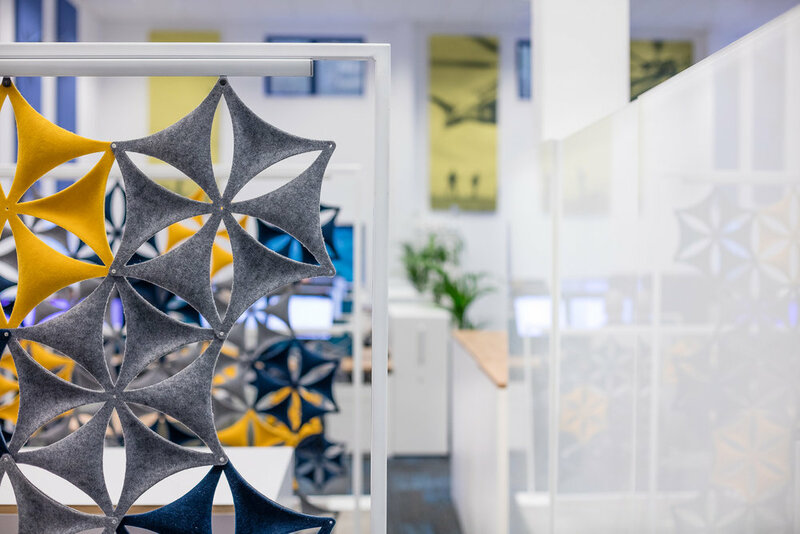 As part of the office refurbishment, all of the floorcoverings were replaced which included both carpet tiles and commercial grade luxury vinyl providing a subliminal division of space and work setting. 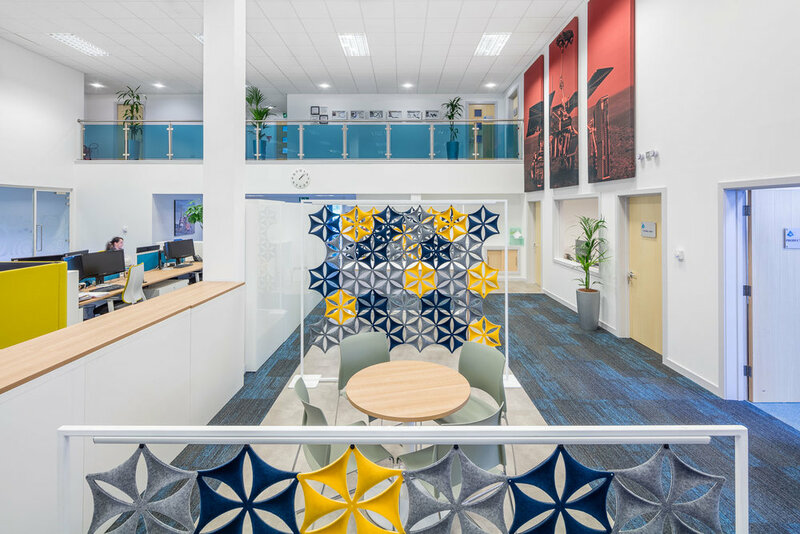 The entire building was also redecorated which was a challenge in itself, given the double height ceiling within the main office area – lot’s of working at height but all managed safely and efficiently by the Amos Beech Project Management Team working with our skilled tradesman. The reception area was included in the program too and again given the changing nature of work, rather than create a reception area per se, this has become another collaboration area because of course, there are not visitors 100% of the time so why not make double use of the space. Upstairs, the staff kitchen and break-out areas were given the Amos Beech treatment and this has been revitalised with new furniture and floorcoverings to make it a place to go and relax during lunchtimes and breaks as well as having the potential to grab a quiet coffee with a colleague during the working day. Little details were not overlooked, the Amos Beech team were keen not to replace things for replacing’s sake. The meeting room table had a good quality table but the surface finish didn’t match the new décor so rather than throw the whole thing out the top only was replaced to match in with the new office furniture supplied. A great showcase of what can be achieved whilst the staff didn’t have to move out with the work being carried out over weekends and evenings. Amos Beech delivered this stunning project with interior design by Cubit3D over a 12-week period. Bringing together all of the teams under one roof for Plexus was a challenge in terms of delivering the required functionality, providing for the individual needs of the various teams and including the bespoke display areas for the products that Plexus manufacture. 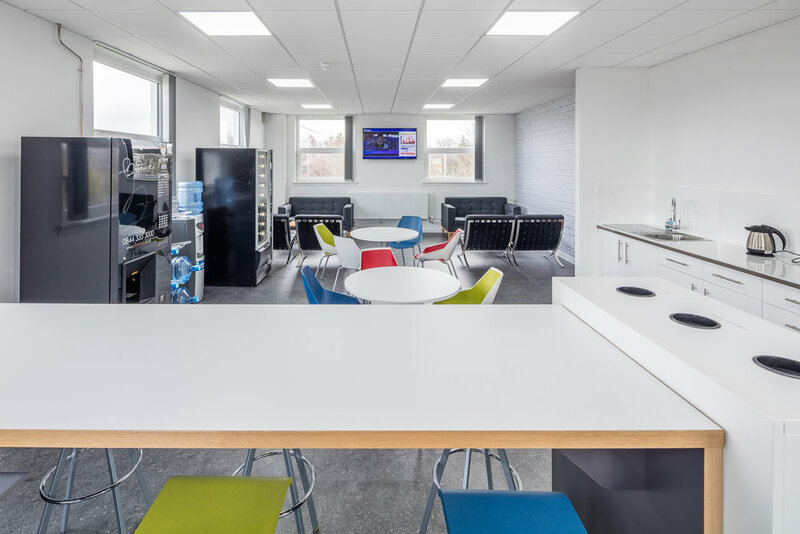 Including acoustic ceiling rafts with integrated LED lighting in the overall scheme along with bespoke break-out meeting points and low level storage the finished project is an open plan environment that delineates space and controls noise levels. 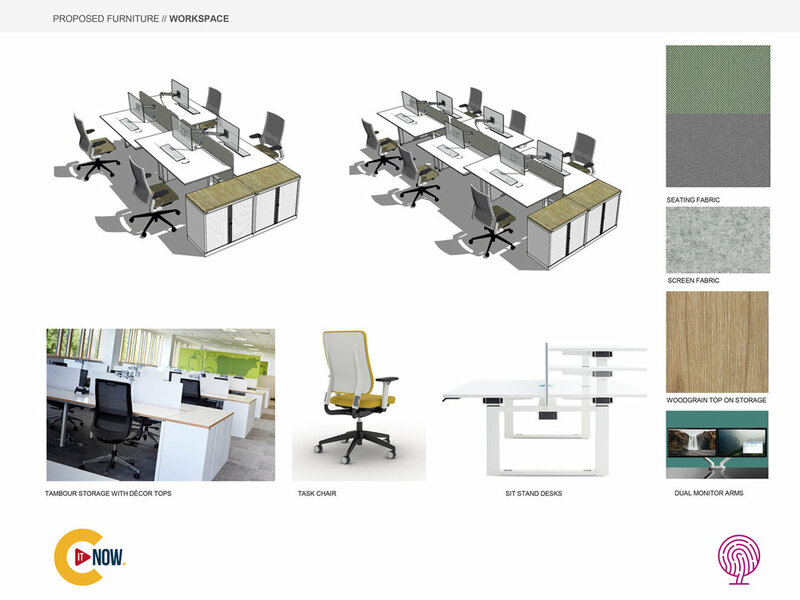 Plexus selected the Vital Plus range of office furniture. This highly functional and flexible system neatly encapsulates the varying needs of each department and provides a consistent ‘look’ as you move through the office. Meeting room furniture and conference furniture has been fully integrated with the AV systems that allow Plexus to communicate globally. A range of laminate and veneer tables have been supplied for both internal and client facing spaces. The intelligent design means that all cables are completely hidden from view whilst remaining easily accessible to user interface. Taking what was a 15,000 ft² production area within the Pyramids Business Park, Amos Beech have transformed the space by upgrading and altering the HVAC system, installing completely new electrics and data cabling, energy efficient lighting, new ceilings and bulkheads, glazed partitioning, carpet, vinyl and porcelain floorcoverings, bespoke reception desk and product display areas along with all office furniture, seating, meeting room furniture and storage systems.